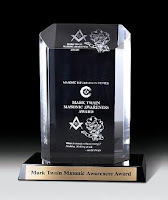 Five years ago, the Masonic Information Center created the Mark Twain Masonic Awareness Award, to "recognize Lodge leadership for asserting a uniquely Masonic identity both within the Lodge and throughout the community that is consistent with the Fraternity's historic focus on education, self-improvement, good works, and fellowship." It's the only national Masonic award of its kind, and it represents achievement at the local lodge level. Lodges that win the Twain award are working hard to make their individual lodge just that—individual. 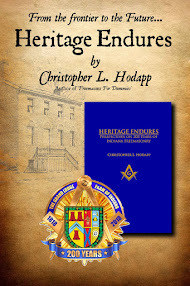 These lodges have found ways to make their lodge unique, distinctive, educational, vital to their members, and a part of the community in which they reside. The Masonic Information Center is a committee recognized by the Conference of Grand Masters in North America, and the Twain Award winners were announced at the Conference in Atlanta. The MIC was originally funded in 1993 by John J. Robinson, author of Born In Blood, who was not a Mason at the time. 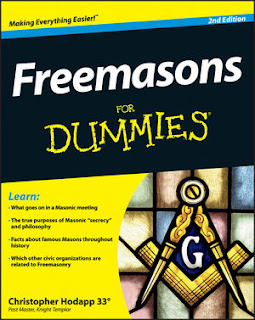 Robinson gave a grant to start the Center in order to provide information to both Masons and non-Masons, and to respond to critics of the fraternity. The Center operates as part of the Masonic Service Association of North America. For more about the Twain Award, see here.